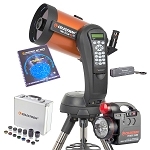 Celestron put together this CGX Equatorial 1100 Rowe-Ackermann Schmidt Astrograph Telescope kit with the combination of their fast focal ratio astrograph and their updated CGX-L motorized and computer-controlled GoTo mount. 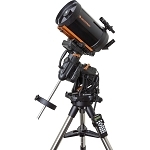 The 11" f/2.2 Rowe-Ackermann Schmidt Astrograph Telescope from Celestron is specifically designed for astrophotography and astroimaging with a large 11" aperture and fast f/2.2 focal ratio. The OTA is being offered by itself without a mount, and comes with a Celestron CGEM-style dovetail plate for use on compatible mounts and tripods. Using 4-element rare-earth optical glass lenses ensures accurate color rendition and elimnates aberrations such as coma and field curvatures. 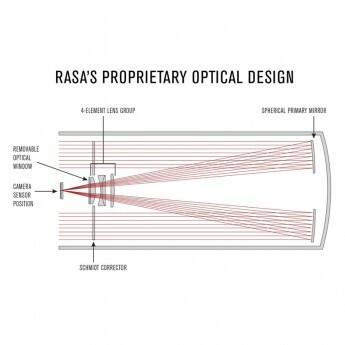 The improved StarBright XLT multi-coating system, which includes anti-reflection coatings on the lenses and highly-reflective coatings on the mirrors, increases light transmission throughout the entire optical path. A 12V MagLev fan reduces cooldown time and provides optimal airflow through the optical tube while filtering harmful dust from the interior. The 43.3mm imaging circle is made to cover today's large DSLR and CCD imaging sensors to capture full-frame shots with vignetting, while a fast focal ratio reduces exposure times without sacrificing image quality and gives the user more time for multiple shots of the same object for layering or with different filters. 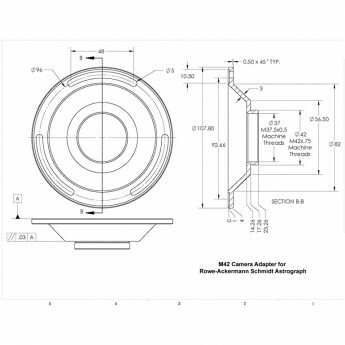 A custom-designed FeatherTouch micro focus system has a 10:1 reducer with linear brass focuser bearing to enables very precise focusing to clearly resolve topographic details on the Moon or split double stars, and reveal details of most other celestial objects in between. Since this OTA is designed as an imaging scope, a 42mm T-thread camera adapter and 48mm camera adapter are provided. Other adapters are available if required. 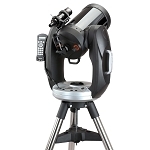 Box Dimensions (LxWxH) 39.0 x 20.0 x 19.0"
The Celestron CGX-L Computerized Equatorial Mount is the extra heavy-duty version of the innovative, accurate, and stable CGX! 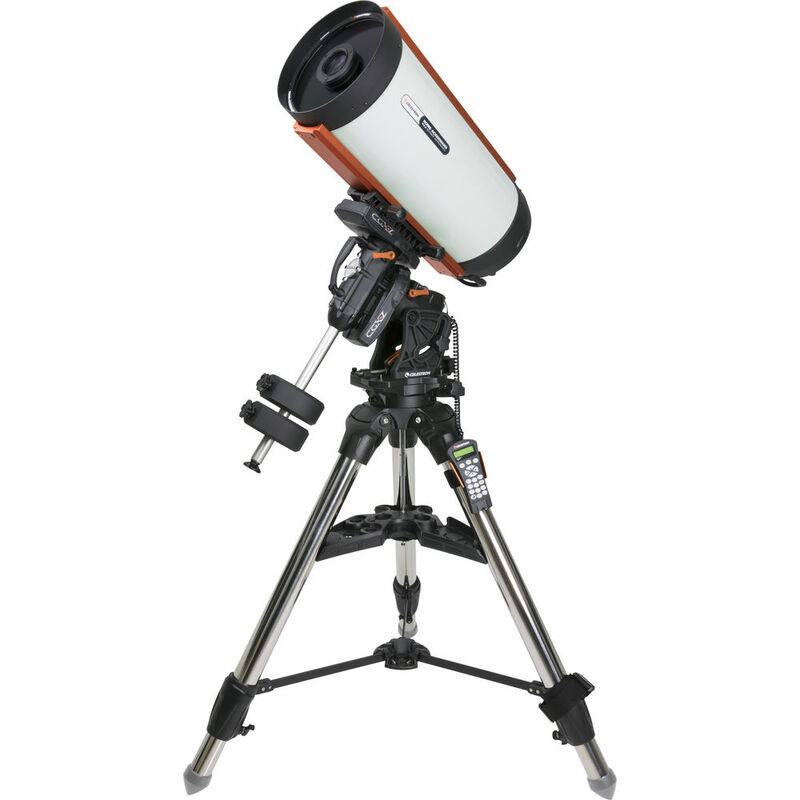 The CGX-L has been designed with an even better load capacity to weight ratio, and is capable of handling an OTA and other astronomical equipment weighing a total of 75 pounds. The CGX tripod is amazingly stable! 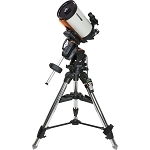 It has a wider stance to handle increased loads, and has huge 2.75” diameter stainless steel legs to support the CGX-L mount and your choice of telescope. 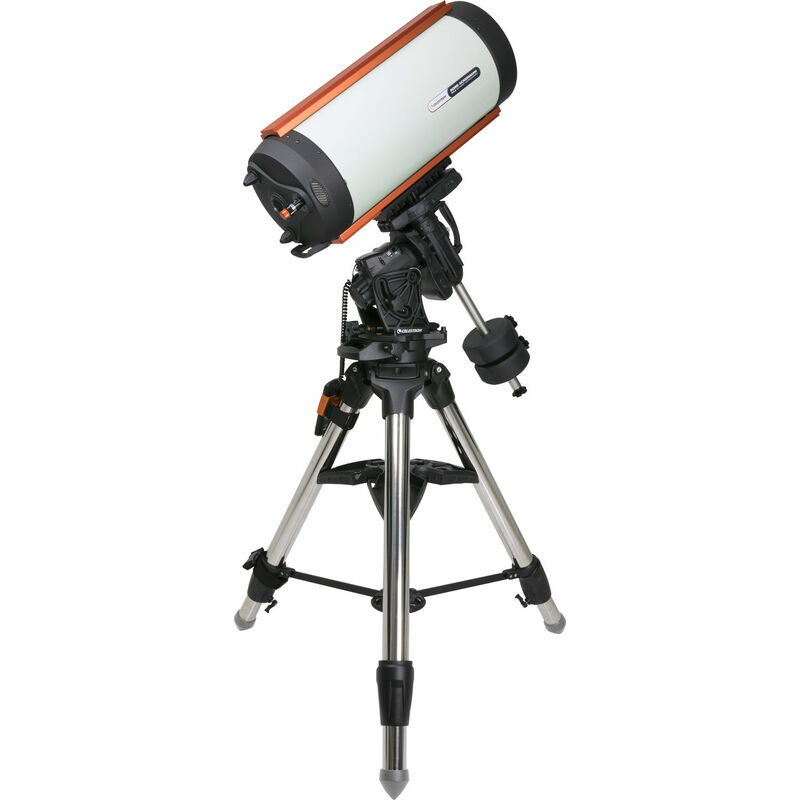 Together, the CGXL mount and CGX-L tripod provide a rock-solid platform for visual astronomers and astro-imagers alike! With all the features of the CGX-L, it is easy for overlook the fact that this is a computerized mount. The Celestron NexStar + hand controller is your interface with the CGX-L mount. It has a celestial database of 40,000 objects, and has fun features such as a automated tour of the best objects up on the date and time you are observing! The backlit buttons are intuitive and easy to use in the dark, and a new USB port on the end of the controller means you won't need an RS232-to-USB adapter. The CGX-L Tripod has been completely redesigned to handle the extra capacity of the CGX-L mount. It’s large 2.75” diameter legs spread wider than usual for added stability, and the height is adjustable from 35.75” to 52.75”. A heavy-duty accessory tray holds three 1.25” eyepieces, two 2” eyepieces, and even has a shelf built in to hold your smartphone or tablet in an upright position! It can stay in place even when the tripod is collapsed, making it much easier to set up, break down, and store your tripod.